Note: Please don’t try on live server. I recommend you to try on some test server before you implement on live server. You can use Digital Ocean server for cheap VPS. They charge just $5 Per Month! Moreover you will get $10 account credit after signup. Tip: If you don’t bother to deal with all these technical stuff, then go and search on fiverr.com and get the thing done for just $5. 2. On your root directory create ioncube loader installation checking php file. if you see “true” then IonCube loader is successfully installed. 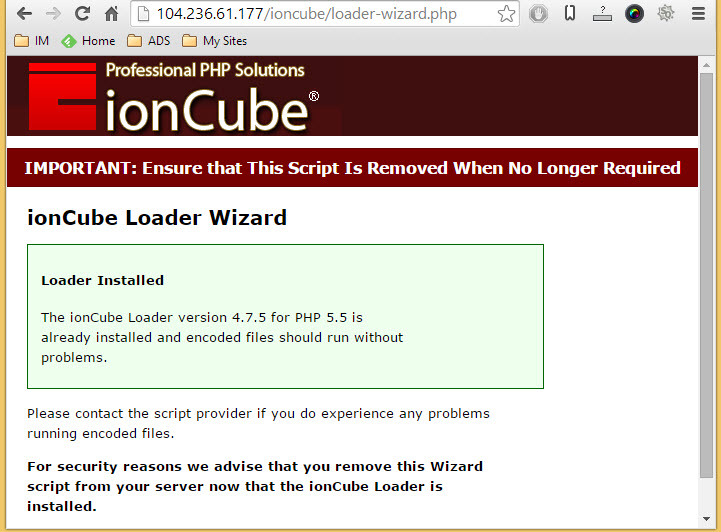 If you see “False” then IonCube loader is not installed on your server. If you got the above result then you are using 64 bit version or else you will be using 32 bit version. In my case I’m using 64 bit version of ubuntu O.S so I need to download 64 bit version of IonCube loader. You can download IonCube loader here. 6. Now download loader from official page. Make sure you downloading correct setup. 9. Once you open choose “Local install” option. Now it will automatically check what are the things we need to do. In my case I’m seeing below errors. The correct loader for your system has been found at /var/www/html/ioncube/ioncube_loader_lin_5.5.so. You may wish to copy the loader from /var/www/html/ioncube/ioncube_loader_lin_5.5.so to /usr/lib/php5/20121212. 10. Check the php version by using below command. Form the above result I can see my php version is 5.5. Note it down somewhere. 12. Now we need to copy appropriate IonCube file to PHP module folder. So navigate to ioncube extracted folder and check 5.5 file. Because our PHP version is 5.5. Notice: 5.5.so (loader file) and my PHP version 5.5.9 (check step 10) are same. 13. As per loader-wizard.php file we need to create one more file called “20-ioncube.ini” at /etc/php5/apache2/conf.d so use below commands to create it. and add below line which you got on 20-ioncube.ini file. Make sure you are adding it on first line itself, that is above [PHP] entry. If you have any doubt feel free to comment. You are a STAR! I have wasted two hours of my life going around and around in circles on this with each tutorial being out of date. Expect a flow of traffic as I’m going to share this over on Digital Ocean! followed these steps and still have he issue. Check 14th and 15th step to fix that issue. Bless you, Arun! Thank you! Very good step-by-step tutorial for ioncube! Just one request: How to create 20-ioncube.ini without using conf.d, instead use the conf-available and conf-enabled folders? at the end worked fine. Thanks again for helping a stupid noob — me. The php code I posted won’t show. It’s about step 3 above missing the closing question mark and closing arrow. I’m not sure what went wrong for you. If you are still facing issues, I recommend you to take any of these services on fiverr.